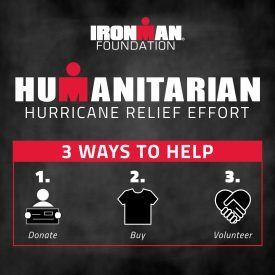 TAMPA, Fla. – The IRONMAN Foundation® has launched a Humanitarian Relief Effort campaign to raise critical funds in response to the major flooding in North and South Carolina caused by Hurricane Florence. Funds raised will support recovery efforts and service projects in the greater race community for IRONMAN® 70.3® North Carolina which is scheduled for next month in Wilmington. DONATE – The IRONMAN Foundation will match all donations made by October 12, 2018, up to $10,000. T-SHIRT SALES – 100% of the proceeds raised through the sale of a custom Humanitarian Florence Relief T-Shirt will go towards the IRONMAN Foundation’s Florence Relief Efforts. VOLUNTEER – Register to volunteer and provide hands-on recovery assistance at local service projects to be announced. IRONMAN 70.3 North Carolina athletes are asked to stay tuned to the event’s Facebook page and www.ironman.com/northcarolina70.3 for further updates as they become available.